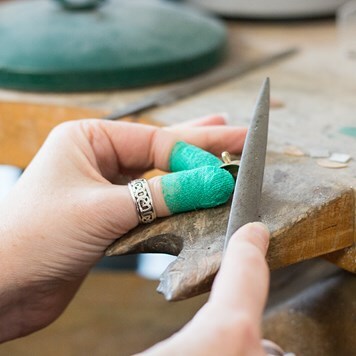 Jewellery making is a wonderful hobby but it's important to stay safe in your workshop. In this blog post we share some of the simple yet important factors you need to consider when making jewellery. From creating a risk assessment to simple things like taking regular breaks. Each one is important to ensure that you keep yourself safe and avoid any potential hazards in your space. This blog post is for informational purposes only, and we advise to do your own further research and seek advice if you are unsure. It is advised to always create a risk assessment, which means you can identify any potential hazards in your workshop and evaluate what methods can be taken to ensure your safety. First you need to identify any hazards in your workshop and list who may be harmed by this and how. You can then evaluate the risks of these hazards and create methods to avoid them. You can review your risk assessment regularly to be sure you're doing everything you can to avoid any problems occuring. Alligator tape is one of our most popular products and is an absolute essential in the workshop! Use the protection tape by wrapping it around your fingers, protecting you from burns, cuts and abrasions which can be caused by cutting, soldering, polishing and more. 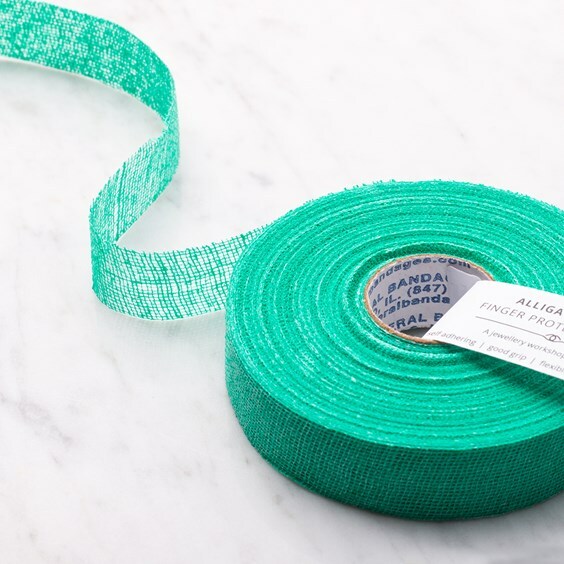 The alligator tape is a safe alternative to gloves, it's flexible and provides excellent grip when jewellery making, making it a brilliant choice for your workshop. Many jewellers work in their own studio, so it's important not to forget about your clothing and potential hazards which can be caused when having long sleeves and having your hair down. It's sensible to always wear clothing which cannot get caught on anything and having your hair tied back to avoid it getting caught. So many jewellery makers suffer from sore hands and this can be a pain after spending hours at the workbench. 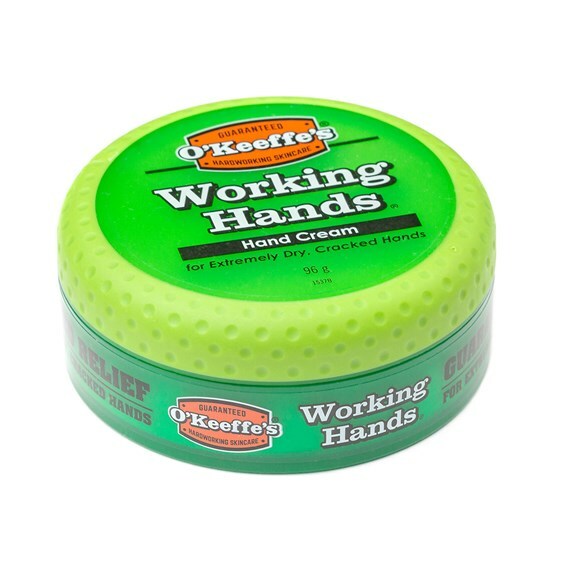 O'Keeffe's Working Hands Hand Cream is a firm favourite among jewellers, used to heal painful cracked skin. Alongside protecting your hands with alligator tape, it's always good to have hand cream nearby when your hands start to feel dry but also once you've washed your hands as this can dry them out. If you work for yourself, it can be hard to stay in a routine. That's why it's always important to schedule in some breaks during your busy day, whether that's stopping for a cup of tea or taking a walk in the afternoon. Having breaks will make you feel more motivated and re-energised to get back to it! Whether you have your own studio or work in your spare bedroom, it is a good idea to have a lock on your door to avoid children or pets gaining access to tools and supplies which could be hazardous. 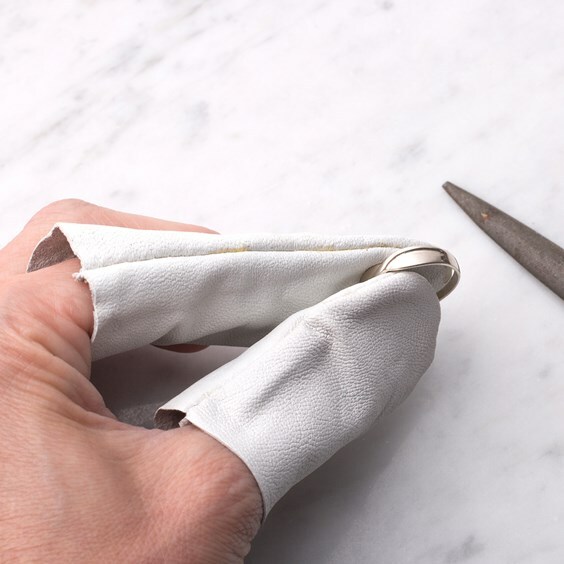 These leather finger and thumb protectors are brilliant for wearing while you're at the polishing machine. They are soft, so they won't compromise your finger movement, making it easier to hold small pieces of work whilst polishing. Each sleeve is fully closed and sealed, protecting your jewellery from finger grease and dirt when handling/cleaning your finished jewellery. When purchasing new tools and supplies, it is always important to read the safety sheets which come with them. If you have lost them, you should be able to find them with a simple google search or by contacting the manufacturer. If you're working with a flame or a torch, you will need a fire plan. You can contact your local fire department for the advice you need and what fire extinguisher you should get for your studio. It's crucial that you identify any fire hazards within your workshop and create an action plan if there is a fire. Protecting your eyes is another factor you need to consider. 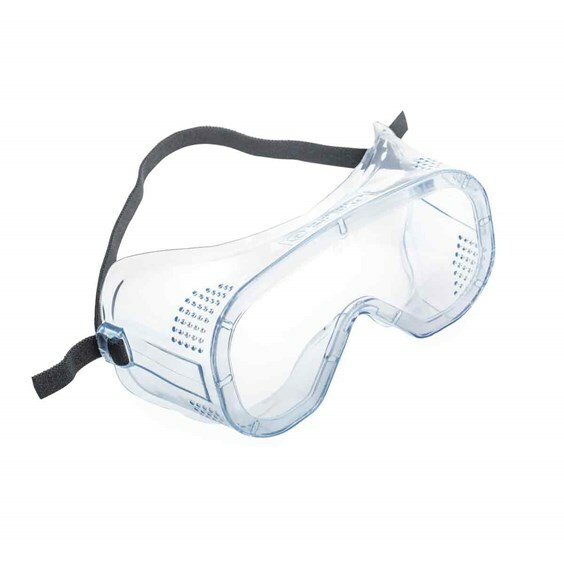 These safety goggles are great to have in your workshop, providing protection against medium energy impact of high-speed particles, sharp objects and chemicals. These goggles also have a vented body to help prevent misting. They can even fit over prescription glasses! Breathing in dust is something you don't want to be doing. Wearing a mask will prevent you from inhaling any harmful dusts or fumes. You need to ensure that your workshop is well ventilated to avoid breathing in dust and harmful fumes. You can install an extractor fan which will take away toxic fumes out of your area. If you're unsure, speak to a professional to help you install the appropriate device. If you are carrying out close or fiddly work, you don't want to strain your eyes. 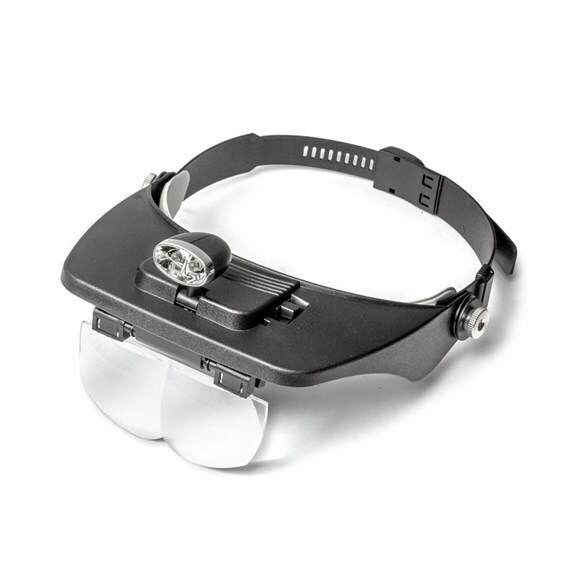 This headband magnifier comes with four magnifying lenses ranging from 1.2x to 3.5x which slot in and out easily. There is also a double LED light which can be switched on or off. It can also be used on top of prescription glasses. Not only is it great for fiddly work, you will also find that you have an incredible professional finish on your designs compared to working with your normal eyesight. We really couldn't be without this! Whether you're a hobbyist or full-time jeweller, is it essential that you have enough light in your workspace. You're often handling fiddly parts, small stones and tools, meaning you need to see clearly your space so you don't injure yourself and can avoid mistakes. You can arrange your bench so you work next to natural light during the day, you can also purchase a lamp for your desk or get a brighter bulb for your room. 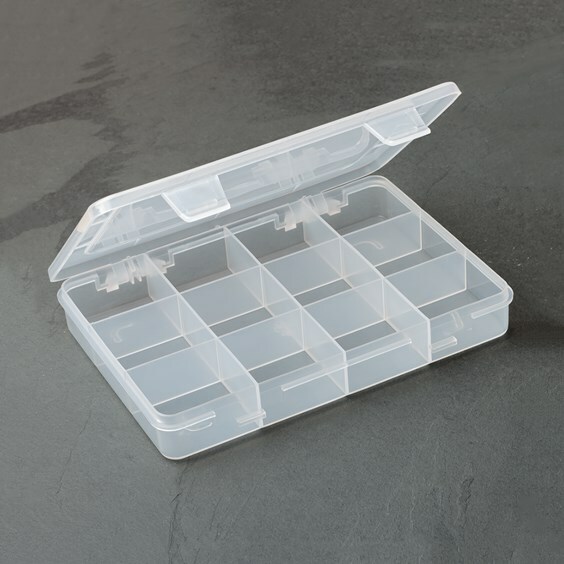 If you keep your jewellery workshop tidy and organised, you will avoid having any problems such as injuring yourself. It's also important to keep your chemicals stored properly and securely, out of reach of any children or pets. You'll also be thankful that all your supplies are in their own homes and within easy reach. It's always easier to clean as you go! These are only a few tips on how to keep yourself safe while making jewellery. We recommend using your own common sense in your workshop, conducting your own risk assessments and doing further reading and research. Explore our jewellery making books, many providing great safety advice that you can follow while at your bench.